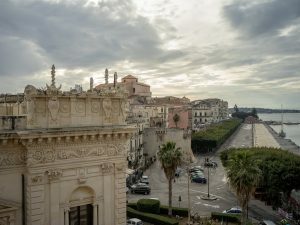 Syracuse (Siracusa) was for some centuries the most important city in the Mediterranean. Just south of the straits of Messina it held a vital strategic position and the island of Sicily had complete control of movements East/West and South/North . The powers of the day, Phoenecian, Carthaginian, all vied to hold the city and the Greeks made it their own from around 400 years BC. Archimedes was born there and Plato and Socrates made it their home for a time. 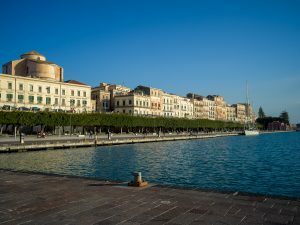 Sicily became known as Magna Graecia and ostentatious temples and structures were built (Agrigento, Noto, Syracuse, … among many others) which mimicked and often exceeded the splendours of Athens. It was inevitable that the Romans would covet this island and their invasion was deemed to be an easy feat. Not so. Archimedes was central to the defence of Syracuse and he constructed very powerful catapults and devices which could lift the invading Roman ships with a claw so they would break up before dumping them back into the water. They repelled the invaders with great efficacy. It took over two years for the Romans to conquer Syracuse. Archimedes died in the battle. His grave was never found. The Romans, as the Greeks before, made Sicily their breadbasket and they prospered there until the demise of the Byzantian Empire under Emperor Justinian who ruled from Constantinople (Istanbul). 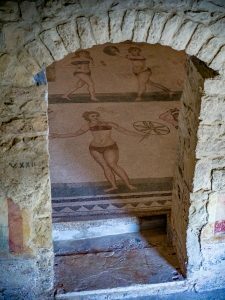 During their period of occupation their influence was total and they had fun, constructing decadent and opulent places such as the Villa del Casale (+/- 400 AD), a holiday retreat for a wealthy landlord and which boasts some of the most well preserved mosaics. The Villa was covered by mud from a landslide for many centuries and was excavated only in the 19th Century. The Moors settled in Sicily after the Romans and preceded the Normans. It was during the Norman conquest under Roger I and then his son Roger II in the 12th century who were most prolific in building the most magnificent palaces using craftsmen from around the empires of the time and chapels such as the Palatina in Palermo and the church and Cloister at Monreale show the fusion between Christian, Arab and Jewish craftmanship. A structure which depicts the historical timeline perfectly is the Duomo in Syracuse. 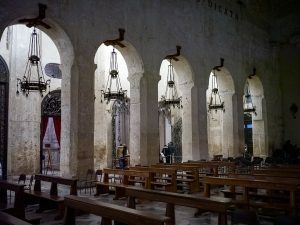 Initially built by the tyrant Dionysius around 400 BC using the spoils of his war against the Carthaginians, the huge columns are still now part of the cathedral. Later under Rome, the temple was converted to a cathedral only to be looted by the Vandals and Ostrogoths. 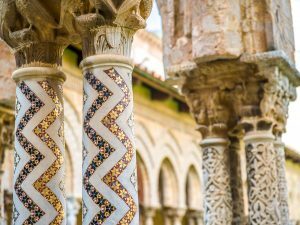 The Arabs conquered Sicily around 800 AD and it became a mosque until the Normans raised the roof and converted it back to a Christian cathedral. While at school in New Zealand I took history as a subject, but Phoenicians, Carthaginians, Byzantians, Vandals, Ostrogoths, Normans seemed to have no relevance for my future so I paid little attention. What a pity and what a waste! 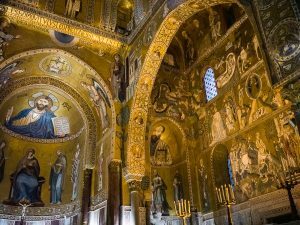 So Sicily has a history which spans 3 millennia and the people and the culture reflects this right up to the present times. Their history has made them tolerant of other people and other cultures and despite the hardships to their economy and social structure they are welcoming to the 4000 per year present day immigrants from North Africa.